NOTE: The first series of Mindful Mamas classes was a huge success! Due to popular demand, Megan is busily preparing and planning the next series of classes. Stay tuned for announcements on dates/times of future classes, workshops & more, or email Megan.Aronson23@gmail.com for information. 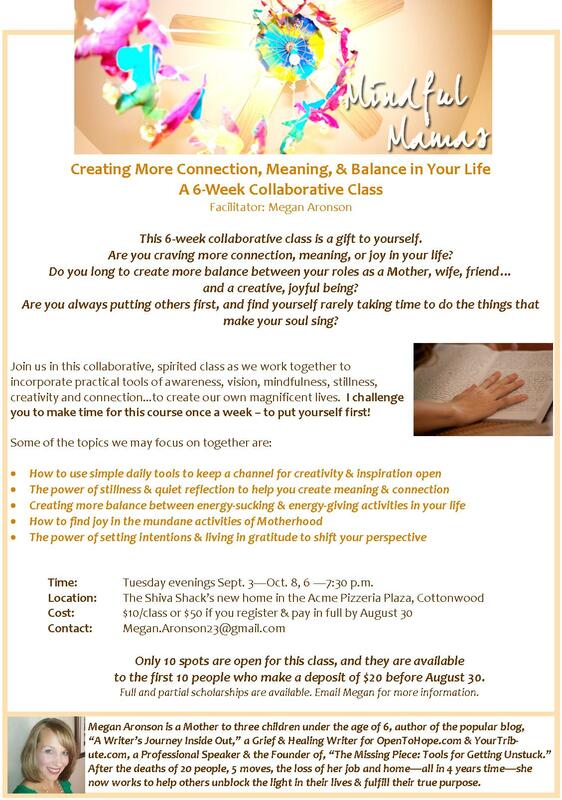 The first in a series of “Collaborative Classes” I will be offering locally and abroad for Mothers who have a desire to create more connection, meaning & balance in their lives! This is a class for Mamas of all ages and ranges – whether you’re a new Mama, a seasoned Mama, a Stay-At-Home Mama, single Mama, or anything in between! “What an amazing 6 weeks that is going to be. You are touching on so many areas of need and frustration of women today. And to put it all in a forum that allows moms to know they are indeed not alone and do have the power to make things better…damn. Over the moon powerful. I’m inspired just reading the flyer. Please email me at Megan.Aronson23@gmail.com to register, or for more information. NOTE: You MUST register by Aug. 31 to attend the class.